Another day another £10.68 million for Capita - The cost of Barnet outsourcing continues to rise. The supplier payments for June have just been published and at £45 million they are up considerably on the previous two months. Capita received £10,687,650.86. £4.23 million was for the Re contracts (planning trading standards, environmental health etc) and £6.45 million was for the CSG contract (call centre, finance, council tax collection, housing benefit administration etc). I am assured that Capita payments are thoroughly checked by Council staff, but when dealing with so much money to just one supplier I think a greater degree of public transparency is vital. Comensura, who Cllr Shooter was asking about at the last council meeting http://reasonablenewbarnet.blogspot.co.uk/2014/07/is-councillor-shooter-getting-straight.html were paid £1,329,285.59 in June, a rise of £271,477.11 on May's payments. So any suggestion that this is a reason for back slapping and congratulations seems a bit premature. Other payments included £3.66 million to Transport Trading a subsidiary of TFL, £676k for Barnet Lighting for all those new street lights many of which were replaced entirely needlessly. Ridgeland Properties is the company owned by the Comer Brothers and is for rental on Barnet's offices at North London Business Park. A further £186,250 was paid out to a company called Dancastle Ltd which represents the rent on Barnet House in Whetstone. NSL the council's outsourced parking contractor received £320k this month. I wonder if Barnet really are getting value for money on that contract? The council also paid out £18,777 in subscriptions to CIPFA Business Limited the business arm of the Chartered Institute of Public Finance & Accountancy. It may be that this is for subscriptions to services such as benchmarking but these days of austerity should mean that all subscriptions come under the closest scrutiny. It is also interesting to see that Barnet Council paid Saracens £3,819 especially as in today's Barnet Times it say that Saracens owe several hundred thousand pounds to Barnet. I still think that there needs to be much greater external and independent scrutiny when signing off over £45 million of payments in just one month but this is Barnet where proper scrutiny remains a wish not a reality. So how much is this Capita contract costing us in Barnet? As you may know, I like to exercise my right to inspect the accounts and in particular to review invoices. This year my focus was on Capita invoices given that in 2013/14 they amounted to £62,743,081.83. Yes you have read it correctly £62.75 million and that isn't even for a full year. At the very outset of the 2013 financial year Capita billed Barnet £340k to pick up the pieces when 2e2 went into administration and to maintain the IT systems through till 15 June 2013. A not insubstantial sum but definitely embarrassing given that Barnet had paid 2e2 their fees in advance so this was paying a second time for the same work. On 27 June Capita invoiced Barnet for £14.74 million for "Interim measures to provide critical services". According to the annotation on the invoice this also included elements of capital. Now bear in mind this payment was made 6 weeks before the main contract was signed. Interestingly when I asked where the contract for this interim support existed I was pointed to the main contract where it had been neatly written in. So to me this looks like the main contract was signed in Augiust to include a contract for an interim service that had already taken place. Very curious and swiftly followed up with a further invoice for "Interim measures to provide critical services" for another £125k for the period 17-28 June or an extra £10k a day. We then had a tranche of invoices on 6th August (the very same day the contract with Capita was signed) for capital investment - remember the capital investment that previous councillors said Barnet did not have and could not fund. 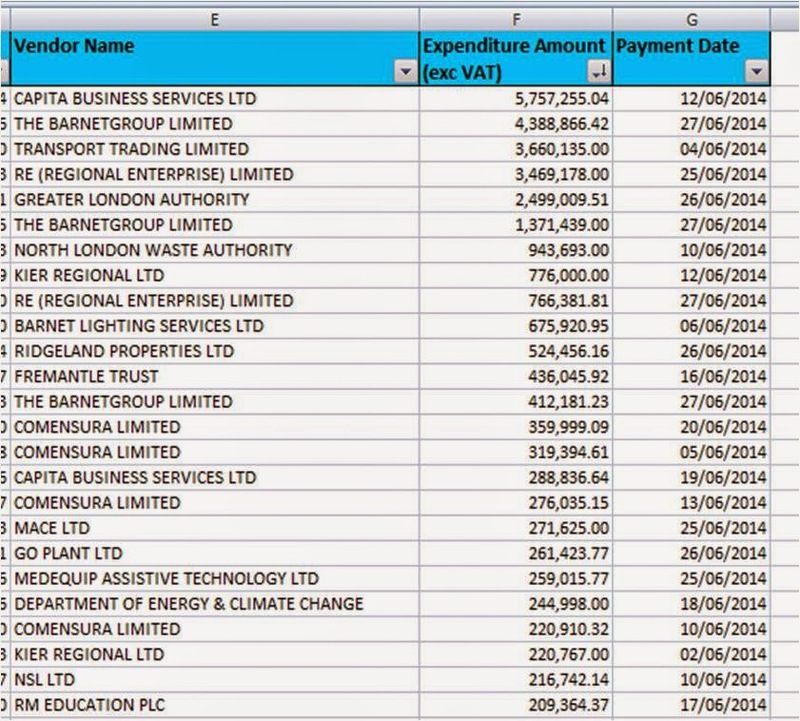 Those invoices amounted to £10.478 million for various IT systems. At the end of August and the first couple of days of September Capita invoiced Barnet £11.7 million for "Periodic Service Payments". From what I can understand these are the payments for actually delivering the service and relate specifically to the NSCSO (CSG) contract. On the 30th September Capita under its "Re" contract (DRS) invoiced Barnet £5.18 million for the contract that started on 1st October. From then on to the end of the year there are a number of payments including two periodic payments for the CSG contract each of £6.89 million and a further Re contract payment of £3.4 million. What intrigued me were a couple of comparatively small invoices,one on 27 November and one on 9th december for a total of £417,007. What this payment relates to is a clause in the contract called "Gainshare" where Capita get a cut of any savings made. Although the contract is redacted it is apparent from the numbers on the invoices that Capita receive 40% of any savings made. I felt deeply uncomfortable about these savings and have been trying to understand how such savings could be made so quickly. Following a great deal of correspondence with the council and having several subtly different version of how the savings are justified I have been told that these savings are the estimate of savings to be made over the next year, that Capita invoice Barnet upfront and then at the end of the year if the savings are not as great as Capita forecast then Capita have to return some of the money. Frankly I was staggered that the council should be sharing out quite so much of the savings of our money and paying out forecast savings as much as a year before they are realised. Personally I cannot believe that any commercial organisation would countenance such a one-sided deal but this is Barnet Council we are talking about. Transparency on these savings is absolutely zero. I have asked repeatedly for evidence and it has been promised as recently as Tuesday but it still has not materialised. Indeed one of the largest elements of this saving relates to an area which I believe is virtually impossible to audit which should make everyone very uncomfortable. So what you may say. It's £417k out of a massive budget. However this week Barnet signed off approval for contracts worth £594 million to be procured. Most of these are existing contract so will Capita be entitled to 40% of the savings on all those contracts? Let us say that they realise 10% savings possibly by squeezing residential and nursing homes who will in turn squeeze staff wages in exactly the same way that Your Choice Barnet have cut the wages of staff by 9.5%. If that were the case would Capita be entitled to £23.76 million of "Gainshare" which they will bill upfront? Do any of the councillors who signed the contract know? Was the matter raised by councillors on Tuesday evening when the approved the procurement exercise? There was no debate on the subject and Dan Thomas did not allow any scrutiny from Cllr Paul Edwards who wanted to asked questions. Barnet have signed up to a contract which increasing appears immensely complex and entirely one sided with not one councillor bothering to query why so much money has been paid to Capita in such a short period of time. At the Audit Committee this week one of the independent committee members said quite firmly " I am not prepared to sign off accounts I have not read". What a shame Conservative councillors did not take the same approach before they signed off this massive Capita contract. Is Councillor Shooter Getting a Straight Answer - or are Barnet Fudging the Figures? At tomorrow's Council meeting there is a section for questions to the Leader which you can read in full here. 2013/14 was £3.276m lower than in 2012/13. As I take a great interest in how much things cost at Barnet Council - because it is our money being spent - I knew this did not seem correct. Set out below is the email I have sent to Cllr Shooter and I genuinely hope he bothers to ask some more probing follow up questions. We will have to wait and see tomorrow. If not it will demonstrate that these questions are simply about showboating and not about genuine scrutiny. I see that you have asked a question at the Council meeting tomorrow regarding the trend in use of agency staff. I am however puzzled at the response you have received as these figures do not appear to concur with the figures produced in the supplier payments system. In addition I would point out that whilst the response says that agency staff costs fell by £3.276 million in 2013/14, the supplier payments system suggests that agency and interim staff costs in fact rose by £1.249 million compared to 2012/13 (2012/13 £12,526,942.66 versus 2013/14 £13,775,545.95). Perhaps someone will be able to explain why there are such massive anomalies between what you have been told and what the supplier payments system states. Either way there is a major error. I would also point out that I did discover an £8.4 million error in Supplier Payments in April 2014 which led to the figures being re-issued. I would also point out that since April 2014 it is no longer possible to make comparisons of activity type for payments as many are now simply classified as “various” significantly reducing the transparency of the supplier payments system. If you wish me to provide the evidence supporting my figures I would be more than happy to do so. Papers for the forthcoming council meeting set out, amongst other things, the members allowance scheme and the responsibilities of key committees. When the Council was considering changing from a cabinet system to a committee system there was much talk about how it would give backbench members more of a role. The reality appears to be giving more Conservative councillors the opportunity to gain a special responsibility allowance. This is the allowance paid on top of a basic councillors allowance of £10,597. The Leader Cllr Richard Cornelius receives an additional allowance of £34,000 which is probably fair enough given that the role does take up a great deal of time. The deputy leader Cllr Dan Thomas receives an extra £27,000 which does seem excessive but that has always been the practice. Where I start to have a real objection is the number of chairmen (they are all called Chairman regardless of actual gender) and vice chairmen who now get an allowance. Given that the Conservative group have always held all the Chairman and Vice Chairmen posts, this means that it will be possible to allocate a special allowance to every single one of the 32 Conservative councillors. Looking at what councillors have to do for this special allowance, the work load does seem to vary. For the Residents Forums the Chairmen have to chair 4 meetings a year which means that for each meeting they receive £592 for a committee which lasts a maximum of 2 hours. The area sub committees also meet 4 times a year immediately after the residents forums. The chairmen of these committees, Cllrs Sowerby, Old and Gordon therefore receive £2,213 for each meeting they chair. That strikes me as completely over the top. We then look at the highest paid chairmen. For example, Cllr Davey chairs the Housing Committee which meets 4 times a year. While accepting that there is some work to be done outside the committee meetings, £3,833 per meeting does seem completely out of proportion given that it is on top of the £10,597 basic allowance. From my perspective this entire exercise has been about jobs for Tory councillors and exceptionally well paid jobs to boot. These councillors may claim they are running the council but in reality there is a team of highly paid senior executives earning six figure salaries to do that job. What also strikes me as bizarre is the fact that for all the committees holding meetings most are simply talking shops with virtually all the power resting in just one committee, Policy and Resources details of which you can read here. On a day when local authority workers are striking over low pay, it does seem rather offensive that so many Conservative councillors are planning to reward themselves with so much for so little.